In the premiere of the brand new SFG series Cult Heroes, Sam Crocker rhapsodises about the Burkina Faso journeyman Paul Keba Koulibaly. 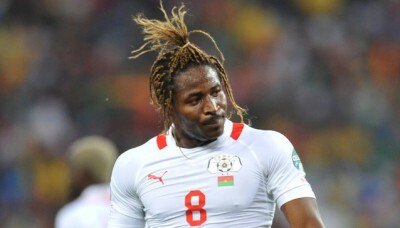 We make no secret of our adoration and fascination with Burkina Faso here at Sandals for Goalposts. Broadcast from the rooftops of SFG Towers, a day spent looking at Charles Kabore’s pass completion rates is a day well spent, and we would happily kill our uncle if it meant Paul Put could step into the void. Indeed, part of joining the SFG team is that you have to sign the SFG Rice-orandum of Understanding, in which you agree to sign your daughter away into an arranged marriage with a member of the Burkina Faso national team, should any of them be interested. There is one man which each member of the SFG team has his fingers crossed over, hoping that one day they will see their daughter walk down the aisle towards at some point in her future. That man is Paul Keba Koulibaly. A man whose career knows no geographical boundaries. A man who shrugs at war zones. A man who feels no pressure – apart from the pressure to look cool. Making his name alongside Bakery Traore during his country’s run to the final of AFCON 2013, Koulibaly became a brand. Like an imagined tranquil pool in the middle of the desert, he is so relaxed it’s almost as if he’s a mirage. The calming presence in the cataclysm of organised chaos that sits in front of him, flowing forward with great speed and intent. Whilst a relaxed attitude amongst African footballers is far more common that their European counterparts, Koulibaly sets the low, placid standard. Strolling about the pitch, his calmness on the ball and in defence allows Burkina Faso to be who they are, knowing that – despite his arguably deficiencies in terms of talent – there will be no panicky clearances or wayward headers behind them. As well as his consistently sublime performances as part of one of the strongest defensive units in the competition, perhaps Koulibaly’s defining moment came at the other end of the pitch, during the semi-final penalty shootout against Ghana. In what must be a shootout record in terms of the proportion of penalties taken by defenders – with three out of nine taken by centre-backs from either side – Koulibaly stepped up third. After seeing his centre back partner Bakary Kone sidefoot his penalty cooly into the top right corner, Koulibaly proceeded to send a tame spotkick slightly to the left of Ghana goalkeeper Fatau Dauda. Was he arsed? Of course he wasn’t. Emotion is not something that Paul Keba Koulibaly has to deal with. With the look of typical indifference to what had just happened, he turned around and walked back to his teammates, probably thinking about what he was going to have for his dinner that night. Koulibaly’s relaxed attitude is not just something limited to the world of international football, however. After leaving Burkinabe giants EFO, he headed north to Libya, where he spent three seasons playing for three different teams. He then headed to Belgium to join Third Division B club ROC de Charleroi-Marchienne, before immediately joining Dinamo Bucharest, without making an appearance for the Belgium club. After this, he did what any normal footballer would do after a year in Romania – move to Iraq. Joining Baghdad-based club Al-Shorta for a year, he then headed off to Egypt, where he joined ENPPI Club. This is where his Wikipedia page ends. According to his Facebook fan page (of which “liking” is a mandatory section of the SFG Rice-orandum of Understanding), he is now in Guinea at club AC Horoya. But frankly, he could be anywhere. No one puts Paul Keba Koulibaly in a box. Unfortunately, he was ousted from the central defence for AFCON 2015 by uppity young whippersnapper Steeve Yago, coming all over here with his “talent” and conventional career path. A disastrous campaign in Equatorial Guinea, it was rumoured that a bonus dispute contributed to the players’ collective capitulation. But it is undoubted that Paul Put – relieved of his duties after the tournament – is sitting at home wondering how different it could have been if he had just played Paul Keba Koulibaly. He is basically the player equivalent of what Burkina Faso once stood for. Whilst Put was always seen as the managerial equivalent, Keba is Put’s spirit on the field. You don’t quite know why it works, but is just does.